Part 4 in a series analyzing the use of the Braden Scale for Predicting Pressure Sore Risk® in the long-term care setting. For Part 1, click here. For Part 2, click here. For Part 3, click here. The Braden Scale category of activity focuses on how much (or how little) the resident can move independently. A resident can score from 1 to 4 in this category, 1 being bedfast and 4 being no real limitations. It is important to keep in mind that residents who are chairfast or bedfast are almost always at risk for skin breakdown. Bedfast: confined to bed—think of residents with severe stroke, spinal cord injury, on bedrest due because of a wound or other issue. Chairfast: ability to walk severely limited or nonexistent. These persons cannot bear own weight and/or must be assisted into a chair or wheelchair—think of non-weight-bearing as a result of surgery, foot wounds, stroke, paralysis, etc. Walks Occasionally: walks occasionally during the day but for very short distances, with or without assistance. Spends most each shift in the bed or chair—think of those residents who use a wheelchair as their main mode of transportation to and from appointments, those who are weak, etc. Walks Frequently: walks outside of the room at least twice per day and inside of the room at least once every two hours during waking hours—think of those residents who do not use a wheelchair at all, are mostly independent, are not high fall risks, etc. Remember, when calculating the Braden Score, the higher the number, the lower the risk. So, if someone is 19 or above, there is no risk for pressure injury development based on our evidence-based tool. With that being said, when looking at activity, it is important to break down the Braden Scale categories and look at details. If residents are walking with a prosthesis, they’re at risk for friction or shear (another category of the Braden Scale), even though their activity level may be acceptable. If they have a wound on their foot and are non–weight bearing, they’re going to be spending more time in bed or chair, putting them at a higher risk. If they’re a fall risk and need assistance with ambulation, they may not be walking as much as someone who needs no assistance. If they’re short of breath with exertion and can complete only transfers or maybe a couple of steps, then they would be at risk in this category. 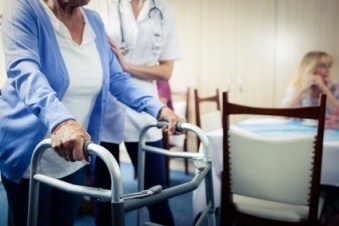 Many residents who are hospitalized are not functioning at their normal capacity in terms of mobility; they’re weaker, have pain, have shortness of breath, are not feeling 100%, etc. A resident’s level of activity may change depending on the shift, but it is important to look at the overall picture of the resident, not just that the resident is sleeping in bed on night shift. In summary, activity is a small part of a larger scale that contributes to the big picture of: is this person at risk for developing a hospital-acquired pressure injury? If so, what interventions can I put into place to decrease this risk? Some things to think about are consulting physical or occupational therapy after consulting with the provider, if appropriate, evaluating for appropriate seating and sleeping surfaces, performing turns every two hours, weight shifting when up to the chair, toileting, hourly rounding, and encouraging mobility and independence as much as possible. As we look at the Braden Scale score in its entirety, it is always important to look at the big picture and ascertain why the resident is at risk. That way, appropriate interventions can be put into place to prevent pressure injuries. Note: For anyone who wishes to utilize the Braden Scale in their health care facility, you must request permission to do so. Please visit www.bradenscale.com and complete the Permission Request form. Holly Hovan is a WOC nurse at the Cleveland Veterans Affairs Medical Center in long-term care/geriatrics. She has been practicing as a WOC nurse since 2013. Ms. Hovan has a passion for education, our veteran population, and empowering others to learn and succeed.